A 3-month-old male infant presented initially to the emergency department with a 1-day history of fever, vomiting, cough, nasal congestion, and rapid breathing. He was discharged from the emergency department (ED) with a diagnosis of viral bronchiolitis after clinical improvement following treatment with azithromycin and steroids. A next-day follow-up examination by the child’s pediatrician revealed the patient’s respiratory symptoms had improved, but also revealed bright red blood in stool. The patient also had decreased urine output, refused breastfeeding, and had lost some weight. The patient was admitted with mild to moderate dehydration, and abdominal imaging was performed. 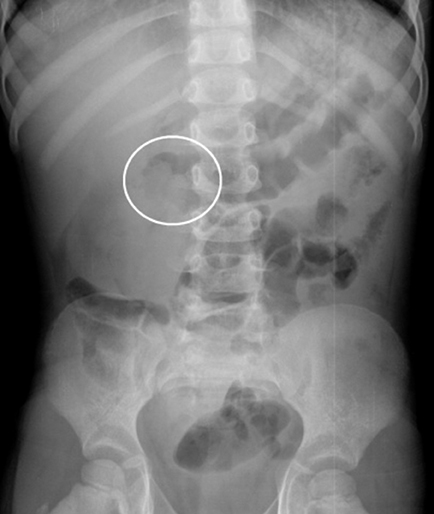 Plain film radiography of the abdomen demonstrated multiple dilated loops of small bowel suggestive of small bowel obstruction. The clinical picture and abdominal films suggestive of bowel obstruction combined to generate a concern for intussusception; therefore, an emergent ultrasound of the abdomen was performed. The ultrasound revealed a targetoid appearance (Figure 1) in the bowel and a pseudokidney sign (Figure 2) consistent with intussusception. 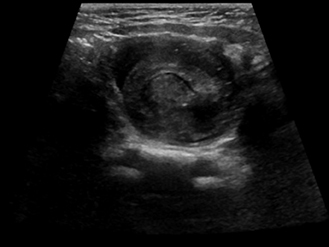 Immediately following the scan, a therapeutic contrast enema was administered multiple times in an attempt to reduce the intussusception but was unsuccessful. At this point, the patient was referred to a tertiary care center. 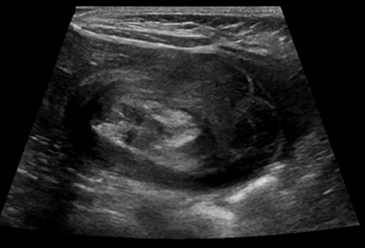 The initial imaging of children with suspected intussusception should be performed with abdominal ultrasound. Marinis A, Yiallourou A, Samanides L, et al. Intussusception of the bowel in adults: A review. World J Gastroenterol. 2009;15:407-411. Slovis T L. Caffey’s Pediatric Diagnostic Imaging. Mosby Elsevier. 2008;2: 2177-2186. Bines JE, Liem NT, Justice FA, et al. Risk factors for intussusception in infants in Vietnam and Australia: Adenovirus implicated, but not rotavirus. 2006;149:452-460. Ko HS, Schenk JP, Troger J, Rohrschneider WK. Current radiological management of intussusception in children. Eur Radiol. 2007;17(9):2411-21. Epub 2007 Feb 17. Bines JE, Liem NT, Justice F, et al. Validation of US as a first-line diagnostic test for assessment of pediatric ileocolic intussusception. Ped Radiol. 2009;39(10):1075-1079. Del-Pozo G, , Albillos J, Tejedor D, et al. Intussusception in children: Current concepts in diagnosis and enema reduction. Radiographics. 1999;19(2):299-319. Radiological Case: Intussusception. Appl Radiol. Case prepared by Dr. Kang while at Fort Madison Community Hospital, Fort Madison, IA, and Mr. Peters while at Des Moines University – College of Osteopathic Medicine, Des Moines, IA.